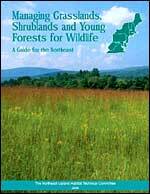 Grasslands, shrublands, and young forest habitats (collectively referred to as early-successional habitats) have been declining throughout the Northeast for decades as have the wildlife species associated with them. For instance, twelve of sixteen shrubland birds and seven of ten grassland birds have declining population trends in the region. Many are listed as threatened or endangered in several northeastern states. Additionally, American woodcock have declined by 40% over the past 30 years, and New England cottontails occur in only 20% of the area that this species was historically found. Given that more than 73% of forestland in the region is privately owned, it is imperative that landowners and the professionals that provide guidance to them help to address the decline of these habitats.